The SSV Trafalgar escorts a bunch of Alliance Bombers. The 220 meter long Trafalgar class Frigate of the Earth Systems Alliance was developed in 2186 as a advanced Anti fighter ship and to replace or support the older Alamo class Frigate. The overall design of the Trafalgar is an enlarged and improved hull design from the Tyr class Covette. The Trafalgar class saw first actions in the Reaper War and many new ships of this class were part in the after war reconstruction of the Human fleet. Trafalgar Frigates benefited from the human/turian joint venture efforts of building the Normandy class. Thats why many interior and exterior parts show a common design. Its a high tech ship with state-of-the-art stealth systems, cyberwar defense and offensive systems and a high performance drive which give the ship the maneuverability to avoid every long distance fire of larger warships. Armed with a full palette of Ultra Violet GARDIAN Laser Defense to intercept missiles, two Thanix magnetic-hydrodynamic cannons and four long range Mass Accelerator Cannons. The Thanix cannons are capable of penetrating the hull of cruiser size starships, but main role is strictly to intercept missiles and fighter crafts. Like all Systems Alliance frigates, the ship is named after a battle. The Trafalgar class is named after the Battle of Trafalgar from 1805 between the forces of the British Royal Navy against the combined fleets of the French and Spanish Navies, during the War of the Third Coalition of the Napoleonic Wars. 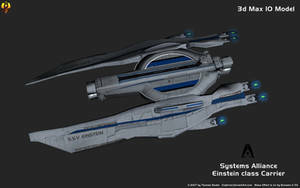 The SSV Trafalgar was part of the Mass Effect 3 War Assets if you scan the planet Norehsa in the Nubian Expanse. The Trafalgar was in the middle of an engine overhaul when a Cerberus flotilla engaged it in a firefight. Barely escaping on auxiliary power, its crew later finished upgrading the ship in record time after meeting Alliance forces. The Trafalgar joined the Alliance third fleet under Admiral Nitesh Singh. Thank you very much! One of my better designs. My favorite of yours it is. OK, I hinted at that last time, perhaps Nelson class next? I trust you'll come with something spectacular. It would nicely complement Trafalgar class. Systems Alliance named their Destroyers after Military leaders. So, Nelson would possible for a Destroyer type vessel. I think about it, when i do another Alliance ship. Awesome work as always. I really like your Mass Effect designs as they are so detailed and thought out so well. Thank you very much! Like the Trafalgar myself much. Think its one of my better designs for the smaller Alliance ships. Your Mass Effect designs are something else. You're more than welcome, keep up the great work.